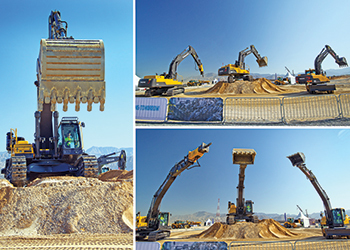 Volvo machines showcase their prowess. Ras Al Khaimah played host to an impressive Volvo Construction Equipment range at an invitation-only event with the theme “Building Tomorrow”. The official launch of Volvo’s latest equipment into the Middle East attracted more than 200 customers. The equipment was put through its paces by a team of Volvo drivers and instructors at a sandy seaside site where visitors could get ‘hands-on’ experience on the latest in Volvo construction technology. The event highlighted that it is innovation that drives improvement in the efficiency and effectiveness of construction equipment. Frank O’Connor, managing director of Dubai-based Al-Futtaim Auto and Machinery Company (Famco), said that the event was exactly the right way to go about supporting the customer, introducing them to developments and listening to concerns. Of particular value was the opportunity to reinforce the very important aspect of relationships with customers. O’Connor noted that in the highly competitive market of construction machinery, “it’s all about up-time, quality and sustainability – core values that very much match the values of the UAE. And it is innovation that gives us the competitive edge”. He added that if innovation could give Volvo customers an edge in up-time, costs, reliability and efficiency, and operator training, then it would in turn give them the edge needed to secure tenders in an increasingly competitive world and turn them into winners. “Without innovation, they are not going to survive,” he said. On display was the Volvo machine simulator. Used for operation training, the device can be sited in a training centre or even taken, as the one on display was, in a shipping container to train operators on site. The advantages were clear; easy access to operator training, improved safety on site and one more positive – trainee operators can make as many mistakes and ‘break’ the simulated machine as many times as they like! Successfully launched were the new 75-tonne excavators, new G-series wheel loaders with the Z-bar linkage, new H-series wheel loaders, the new C series pavers and the new line of hydraulic breakers. Many of the products launched at the event were configured for fuel optimisation, optimised for safety and directed at increasing the bottom line. The market had changed radically, observed O’Connor, because just five years ago the customer would have just one major concern; cost. “Now, we are often confronted with detailed spread sheets, which indicates they are looking very closely at the total cost of ownership and the lifetime of their machines, how they can maximise output and how do we support that,” he pointed out. Liquidity is an issue in the industry, so smart ways of financing and leasing have taken on a greater importance in the acquisition of machinery and including that in the total support package is now of significant importance. Optimisation of the match of machines to the customer requirements by increasing customer knowledge and responding to feedback is an increasingly important aspect of customer relations. O’Connor agreed that it was always the better bet to go for quality of the machine rather than simply the initial cost because ‘without doubt’ longevity of its efficient working life made it a better investment, yielding a greater return. The new machines on show provided a spectacular choreographed show for the visitors. The star of the show was the A40F, a concept that Volvo invented almost 50 years ago. The articulated dumper which, having shown its paces, finished the display with a remarkable demonstration of its stability and manoeuvrability. It involved a formidable two-wheel 45-degree circuit demonstration of the capabilities of the connection between the tractor and the trailer with its high ground clearance, industry-leading hydro-mechanical steering and a maintenance-free rotating hitch design. Other innovations this year from Volvo Construction Equipment include the DD105 and DD25B compactors, and the EW205D wheeled excavator. Volvo Construction Equipment is the oldest industrial company in the world still active in the construction machinery. It started as Munktell’s in 1832 in a machine shop in Eskilstuna, Sweden. Innovative from its early days (it produced Sweden’s first steam locomotive) and its first internal combustion engine in 1893, the company has ever pushed at the limits of technology and quality.